What is Unique ballot link? If this option is enabled, voter/member will recieve the voting link via email. If this option is enabled, voter/member will recieve the voting link via SMS in mobile. If this option is enabled, voter/member will recieve the voting link both in email and SMS. Voter can cast vote only once and this link can't be reused. Note: If the voting link is not recieved in email/sms by any cause then, voter can request for voting link during polling period. 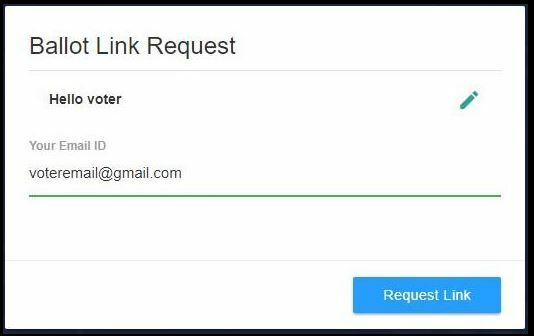 Voter link request option is available only in GOLD plan. OTP(One Time Password)- OTP is generated dynamically and sent to voters email/sms at the time of voting. OTP ensures high security. If this option is enabled, voter/member will recieve the OTP via email. If this option is enabled, voter/member will recieve the OTP via SMS in mobile. If this option is enabled, Voter/member will not recieve OTP via email/SMS. On the day of election voter/member can use the polling link and cast vote without OTP verification. Note: For any support call us at +1(888) 505-5033. What is voting link reminder? You can send reminders to voters at anytime before the election period. reminders are sent to the voters to cast vote during the polling time. This option is available in SILVER and GOLD plan. In silver plan you can send 1 reminder. In GOLD plan you can send 3 reminders. If weighted vote is enabled, The member can cast votes with multiple weightage given. For example, if the election is a shareholder election, a member or shareholder can vote only once to represent the total no of shares he/she holds. Yes, you can change election plans before making the payment. What is Upload Member data? You can upload member data using click to browse button. Member data should be uploaded in excel sheet in the below format. See the snapshot for your reference. Can I change member data? To maintain high security and to avoid typographical errors we do not allow editing of member data once uploaded. However, you can modify the data in your excel sheet and then reload it. Once the records are reviewed and freezed you cannot change it in anyway. If you still need to have the data corrected, you may delete the election itself and create a new election where you can upload the corrected data. Keeping the member data 100% accurate ensures 100% functionality performance of secured voting. Incorrect email-id or incorrect phone number (with country code) may prevent the access to the member to vote as the voting credentials may not be verified. We strongly recommend you to scrutinize the entire member data and then upload to the system. In Manual list, you can enter member data one by one in the given columns. What is duplicate Mobile number / duplicate Email in member data? Don’t include header in .csv? If member data is uploaded with .csv extension then, you need not include headers in .csv file. Please see the below snapshot for your reference. What is .xls or .xlsx or .csv format? You can upload member data using Microsoft Excel(MS-Excel)/Open office. Member data file must be in .xls, .xlsx and .csv formats only. Can I edit member data after Confirm/Freeze? Yes. You can delete or reload your member data until you make payment. Once payment is done, you can’t delete or reload your member data. Missing required fields – If your error records are listed under missing required fields, check whether your uploaded member data have any empty field. Duplicate record numbers – If your error records are listed under duplicate record numbers then check whether your uploaded member data have any duplicate/repeated serial numbers. Duplicate member id – If your error records are listed under duplicate member id check whether you have entered same member id more than once. Member id should be unique for each voter. Case 1: Check whether your uploaded member data have any duplicate/repeated email. Case 2: Check whether your uploaded member data email is in invalid format. (ex: without @ symbol ). Note: If you don’t want to verify duplicate email in your member data kindly uncheck and save the “ Don’t allow duplicate email in member data” option in your election options. Click here to change. Invalid/Duplicate mobile- If you get an error like invalid/duplicate mobile, check whether your uploaded member data having any repeated mobile numbers or not in a numeric format. If you don’t want to verify duplicate mobile numbers in your member data kindly uncheck and save the Don’t allow duplicate mobile number in member data option in options section. What is add minimum candidates? If you get this alert message then you must add minimum number of defined candidates to that position post(s). See the below example for your reference. Case 1: President (1 post) - Minimum number of candidates must be 1. Case 2: Secretary (2 post(s)) – Minimum number of candidates must be 2. If this option is enabled, we include Abstain (NOTA- None Of The Above)/NOTS as an option in ballot. When a member/voter choose not to vote any of the candidates then he/she can choose Abstain (NOTA)/NOTS as an option. You can add candidates using Add New Candidate button.Once candidates are added, you can click the preview ballot and see how your ballot page is designed. Ballot page design will remain the same for your election. Can I delete or edit candidates? Yes, you can delete and edit candidate details until you make payment. Once payment is done you are not allowed to make any changes. Currency is generally an accepted form of money. We accept payment only in USD and INR. Price plan indicates the selections that you made in your election options.If you want to change the plan kindly go to election options and make changes. What is cost per member? Cost per member indicates the amount we charge for individual voter in your selected currency. This may vary based on your election options. Time zone refers to the local time of a region or a country. Make sure that your time zone reflects your country. What is Start At and End At (dd/mm/yyyy hh:mm am/pm)? What is the difference between save and activate? Once you set date, time you can save the election timing. Once you activate the election you can’t change the election timing. You can send reminders to members once election is activated. Reminders are sent to remind the voters to cast vote during the polling time. What is on-campus voting system? If this option is enabled, we provide a unique open link to conduct election. On the day of election voter/member can visit your polling booth and cast vote using the given link. 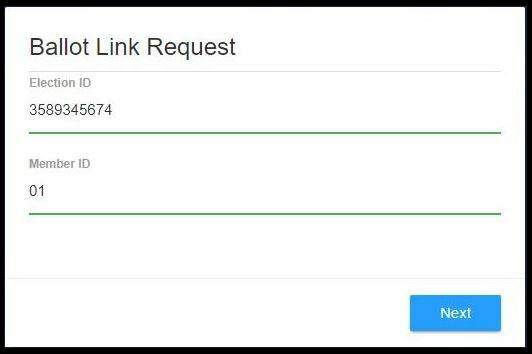 What is unique link request by member? This option is available only in GOLD plan. If this option is enabled, then we resend the voting link to voter/member directly on request during the election period. See the below snapshots for your reference. An Election that is not completed can be deleted and recreated. You cannot delete an election once the payment is processed. Can Election results be modified? Election results can’t be modified. We generate instant result based on number of votes casted during the time of polling. Once the polling gets over the system will generate the results and mail it to the organization registered email id. Who can use our system? The system can be used by any organization or society where they will have to elect their board members by the regular members. What is Abstain/NOTA and NOTS? NOTA means "None Of The Above". NOTS means "None Other Than Selected". When a member chooses not to vote any of the candidates he/she can choose NOTA as an option. Using NOTA for multiple posts of the same position is bit tricky. For a position with multiple posts the elector must select as many candidates as the posts defined. When choosing NOTA option, they can still choose one or more candidates until the last candidate could be NOTA. This means NOTA is selected the elector has the choice to select number of posts minus 1.